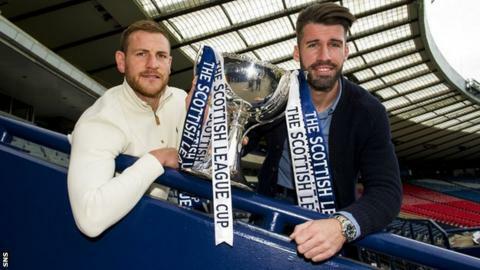 BBC One Scotland will broadcast live television coverage of Inverness Caledonian Thistle v Ross County in the Scottish League Cup quarter-finals. The match will be played on 27 October with a 19:05 GMT kick-off. Greenock Morton v St Johnstone will also take place on that date, starting at 19:45. Hearts v Celtic will be played on 28 October at 19:45 and Hibernian v Dundee United has a date of 4 November, again with a 19:45 kick-off. The Highland derby television coverage will also be available on BBC iPlayer while Radio Scotland will provide coverage of all four ties. In the last round, Inverness beat Livingston 2-0 while Ross County thrashed Falkirk 7-0. Championship Morton claimed a surprise win over top-flight Motherwell after extra-time and St Johnstone defeated Rangers in Glasgow. Hearts beat Kilmarnock, holders Celtic defeated Raith Rovers, Hibs knocked out Premiership leaders Aberdeen and Dundee United claimed an extra-time win over Dunfermline.